« Whatever happened to Trissalicious? It’s embarrassing how, being a founding member of Kulinarya Cooking Club, I’ve neglected our monthly challenges. The one thing about taking an extended leave from blogging is losing the discipline to do every other thing that comes with blogging. Testing recipes, trying to make a dish you KNOW that tastes delicious, actually LOOK delicious, taking pictures, and then there’s the writing! It can be very intimidating. Let me tell you what else seemed very intimidating. Making kare kare. This is a traditional Filipino dish made with a peanut gravy, thickened with rice. It is usually made with oxtail, tripe, and vegetables. To me, this dish was the ultimate in cold weather comfort food. When we moved to Australia I thought the recipe for this dish was to open a pack of Mamasita Kare Kare Mix. This dish was my achilles heel. Surely, there was no way I could make this from scratch. Was there? Which brings me back to Kulinarya Cooking Club. The goal of KCC was not only to promote Filipino food, but also challenge ourselves to learn new dishes with the support of our group. This month’s challenge was to make a Filipino dish but put with a healthy twist. This month I decided to make kare kare from scratch. From the number of Filipino cookbooks I had, I noticed the common theme was the use of rice and peanuts to flavour the stew. As mentioned earlier, this dish is commonly made with oxtail, so my healthy twist was to use seafood instead. Oxtail, when simmered for a number of hours, provides the richness to the stew, something not available when using seafood, so instead, I’ve added some coconut milk for that added richness. This dish was inspired by a meal I had during my last trip to the Philippines. We ate in a home called Bale Dutung, owned by Claude Tayag and his wife Mary Anne. I also later found out that Anthony Bourdain had eaten at Claude’s place when he did a feature on Filipino food. We had ten (at least that’s when I gave up from delicious food overload!) dishes that day and this was one of my favourites. Claude had let it slip during out conversation that the kare kare was made with coconut milk and it does add that extra lucious dimension to the dish. So here is my (late) contribution to Kulinarya Cooking Club. 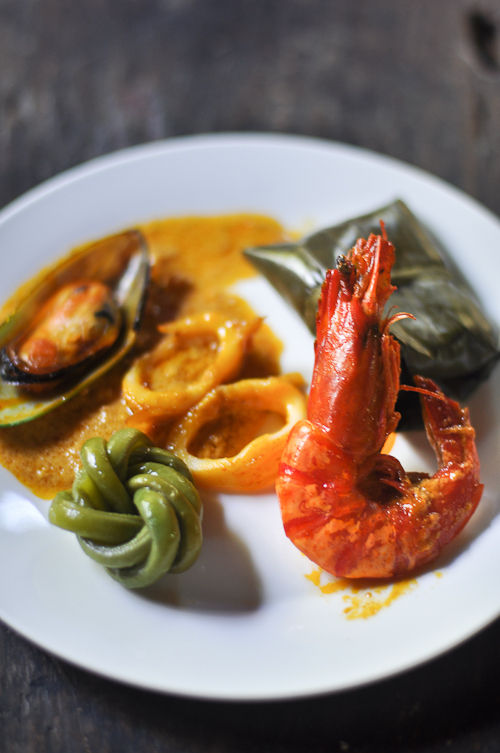 Seafood Kare Kare, served with a steamed bowl of rice and bagoong (fermented shrimp paste). I realized that it wasn’t that difficult to make kare kare from scratch, and, I was really really pleased with how well it came out. Plus, it definitely taste mush better than any Mamasita mix. After I proudly told my sister I had made the kare kare without a mix, she asked me whether I had also made the bagoong from scratch. Make the stock, peel the prawns (reserve a few whole ones for presentation) and place the heads in a pot with 6 cups of water. Bring to a boil then simmer for 30 minutes. Strain the stock and place in another container. Set aside. While the stock is simmering, place the rice in a pan and heat until the grains turn a golden brown, around 10 minutes. Place the rice in a spice grinder and grind until fine. Set aside. Pre-heat the oven to 160c and place the peanuts in the oven and roast until golden, around 30 minutes. Place the peanuts in a food processor and process until it comes together in a paste. Set aside. Heat the oil in a small pot and add the annatto seeds. After around 2 minutes, turn off the heat and allow the seeds to steep in the oil for around 10 minutes. Strain the seeds and heat 4 tablespoons of the oil again in the pot used to make the stock. Add the chopped onions and the garlic. Season with salt and saute until the onions are soft and translucent, around 5 to 7 minutes. Add the ground peanuts and ground rice. Cook for around 2 to 3 minutes. Add the prawn stock, a little at a time. If the sauce is too thick, thin out with some water. Taste and adjust the seasoning with some fish sauce and the peanut butter if necessary. Place the sauce in a blender and blend until smooth. Remove from blender and place back into the pot. Taste and adjust seasoning again if necessary. At this point, add the coconut milk, depending on how thick you want the stew to be. To make the vegetables, Heat the remaining oil and fry off the eggplants until nicely browned. For the rest of the vegetables, you can either place the vegetables in another pot of boiling water and serve on the side of the stew, alternatively, you can add the vegetables to the peanut stew. For the seafood, lightly score the squid and pan fry. Boil the mussels until they just open. Add the prawns, squid and mussels right before serving. Serve with bagoong (fermented shrimp paste), calamansi and steaming rice. Not only does it look healthy, it also looks YUM! And the photos are amazing. on February 14, 2012 at 4:29 pm | Reply K&B N.
I so missed your posts. I hope you are able to post more often. I learn so much from you. wow! coconut milk on Kare-Kare that’s a first (and I have to try it). Some expat friends here in DXB was surprise to know that Kare-Kare is made with peanut/peanut butter. I loved Bale Dutung! Your Kare-kare looks very similar to theirs down to the coiled stringbeans. Great job! 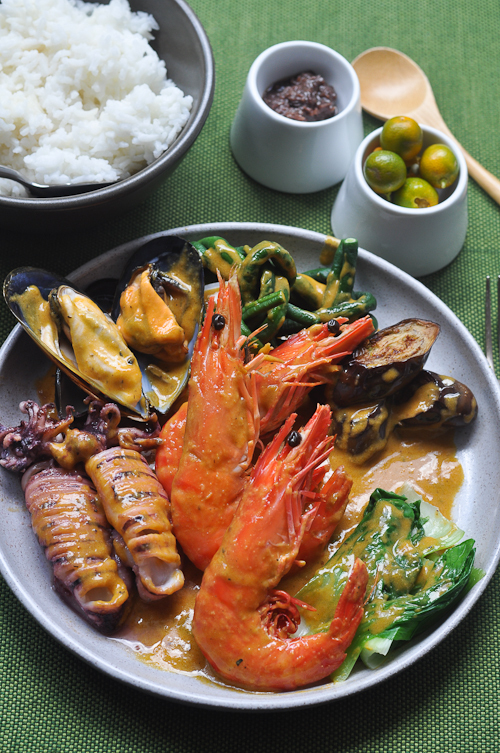 This is a new word and a new “world” for me… seafood Kare Kare! I love seafood and I’m so impressed with this dish, it simply looks fab! This looks hearty Trissa! I love all the different ingredients plus the coconut milk! Mmmmm! This kind of cooking is over my head. 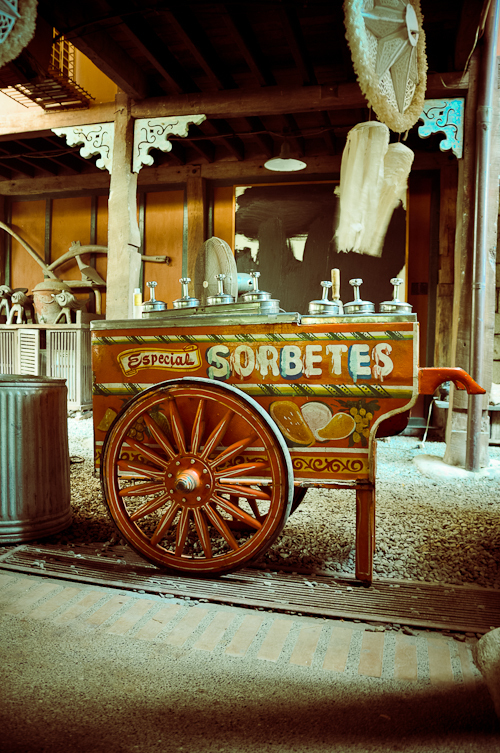 But, I so enjoy seeing what someone else can do with these flavors. Beautiful pics too. That looks amazing. Can I come over next time you make kare kare? I love love love love love your photos, Trissa!! 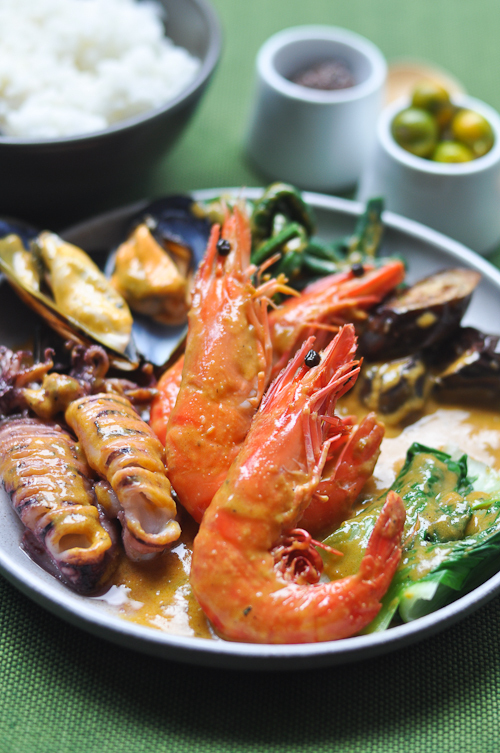 This seafood kare-Kare looks amazing! Welcome back! We missed you here in KCC. I know I was going to write you and Trish and Kat an email already asking where are you guys na haha. I envy you for going to Bale Datung. All my friends who made it there talk about it and they say that it’s a must for me to go there on my next trip.